At Posh Improvisational Cuisine, chef Josh Hebert likes to play. More than a mere habit, even, it’s right there in the name of the restaurant and it’s kind of his thing. So while cross-cultural mashups like his Uni Panna Cotta are standard operating procedure at Posh and commonplace beyond, it’s always refreshing to see such a dish done with an exceptional amount of elegance and restraint. The dish’s creamy, briny star is a quirky, alien-looking little fruit of the sea, most closely identified with Japanese cuisine and, until a recent explosion in popularity, most often relegated to the “challenging” section of a sushi menu. Its appearance, as well as its provenance, have served as a barrier to wider acceptance for decades. 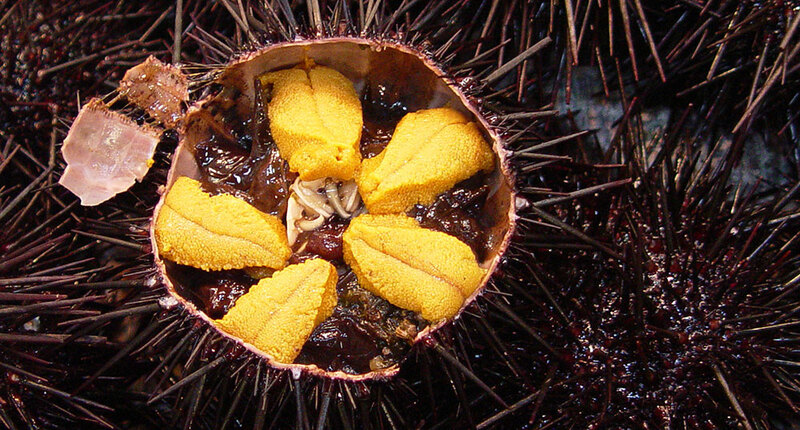 Not to put too fine a point on it, uni is the neon yellow-orange gonads of the hard-shelled, spiky, ocean-dwelling sea urchin (not the roe, as is commonly believed). But while that simple fact has made it a bit of a hard sell, the wider American dining public is at last starting to warm to its charms. Sea urchin has a delicate, creamy texture and a rich, briny, lightly sweet flavor — like an oceanic egg yolk — and it just so happens that some of the world’s most coveted ones are fished here in the United States, off the coast of California. But while the domestic market is growing by leaps and bounds, and sea urchin is used in a number of international cuisines, Japan is still the 800 pound gorilla when it comes to uni consumption, and that’s where most of the California catch is exported. So it should come as no surprise that Hebert, who spent time living and cooking in Japan and who lists Japanese cuisine among his biggest culinary influences, does some wonderful things with uni. Posh’s tagline, “Improvisational Cuisine,” is both mission statement and menu format. Rather than selecting dishes a la carte or choosing a chef’s whim tasting menu, diners at Posh are presented with a ticket listing featured ingredients for the evening that they can circle or cross out as their preferences dictate, and an area where they can note any further desires. The result is something of a personalized tasting menu that keeps the kitchen on its toes. The creative process isn’t limited to service, however. From the moment the kitchen staff arrives, they’re pairing flavors to create a sort of loose framework upon which they’ll build the evening’s menu, remixing especially successful compositions from the night before to give them a fresh spin, and playing with the product they’ve acquired to come up with fun and interesting ways to make it sing. The uni panna cotta came about when Hebert was playing with ways to use the pieces of uni that had been damaged and, while no longer attractive enough to be presented whole, were just as sweet and delicious as the rest. “We tried uni cheesecake, we tried uni panna cotta, and we tried a few other preparations that we thought would play off its creamy flavor, and the panna cotta was the one that worked the best.” Once they’d perfected their recipe for the uni panna cotta, it gave them a signature foundational element upon which they could build personalized improvisations. Though southern Italy, surrounded by the Mediterranean, is no stranger to sea urchin, panna cotta hails from Piemonte, a mountainous region on the opposite end of the country. Panna cotta — “cooked cream,” directly translated — is a simple dessert, originally believed to have been made with lightly cooked cream and milk, and the collagen extracted from fish bones to act as a thickener. In more contemporary times, what’s thought of as a “traditional” panna cotta is made with milk, cream, and sugar, simmered together and set with just enough gelatin to give it a light, jiggly consistency, and topped with fresh fruit, chocolate, or caramel. But such a clean slate is ripe for creative meddling, and Posh’s savory version does little more than remove the sugar and introduce a blended uni base enhanced by Japanese flavors. It starts with the uni, blended with sake, mirin, and soy sauce and then filtered to create an intense base that will flavor the cream. From here, the preparation is very similar to any other panna cotta, starting with the gelatin, which is added to water to bloom. While the gelatin blooms, the milk is gently warmed on the stove rather than “cooked,” as the name suggests. Then the milk is mixed with the gelatin, added to the cream, and flavored with the uni base before being poured into individual cups and moved to the refrigerator to set. Once it’s chilled, the panna cotta is carefully removed from the cup and plated with elements that brighten and accentuate the uni’s unique flavor. 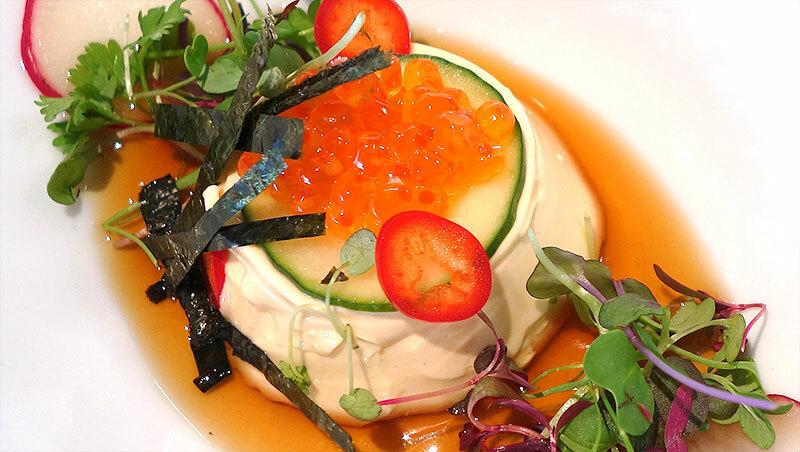 Though he sometimes pairs it with spring flavors like fresh peas, Hebert most often sticks with a Japanese theme, as he did on this occasion. In keeping with Posh’s improvisational theme, it was probably plated with different elements the day before, different elements the day after, and on any given day may look like a very different dish. But on this day, it was bathed in ponzu, garnished with slivered cucumber, Fresno chile, and radish, topped with steelhead trout roe, and finished with microgreens and slivered nori. The result is a delight, and Hebert’s love and admiration for Japanese culture and cuisine comes through with every taste. It really is remarkable how well the uni takes to the panna cotta, its natural flavors brought into focus against the gentle backdrop of sweet cream. It has those same rich, sweet, briny characteristics, but taken to an unusually delicate, refined level. The accompaniments are all natural pairings, either Japanese ingredients or Western analogues thereof, the most crucial of which is the ponzu, with its light, citrusy acidity and the barely detectable, smoky scent of katsuobushi. Radish and cucumber provide a bit of cool crispness, the Fresno chile adds just a tiny bit of chile sting, and the trout roe explodes, tiny bursts of the ocean’s salinity with every bite. Yet the beauty is in how clean and delicate the dish is, how cool and crisply executed, and how every element brings out the flavor of the uni, locked within that elegant, creamy panna cotta. Japanese culinary tradition places paramount importance on preserving and accentuating the natural flavor of beautiful ingredients. It’s a lesson that Hebert has learned well, and it’s what makes a dish as precise and mature as this possible. Posh Improvisational Cuisine is located at 7167 East Rancho Vista Drive, on the east side of the Optima Camelview Village. There is ample parking underground, marked with red placards bearing the name “Posh,” and the restaurant is just at the top of the outdoor staircase nearby. Posh has what may be the best counter experience in town, and a spot can be reserved by calling them at 480.663.7674. There’s even a corner near the pass where a party of four can sit together and be right on top of the action. Though the “menu” allows you to list whatever preferences you might have, the best approach by far is to mark it up as little as possible and let the folks in the kitchen do their thing. And for an awesome change of pace, drop in on Ramen Tuesdays when the crew takes a break from the usual menu and slings some outstanding noodles instead. This entry was tagged contemporary, Italian, Japanese, panna cotta, sea urchin, uni. Bookmark the permalink. I tried this once but found it too intense on its own. Spread over crostini, it might work for me.